Chatting with all your friends on your phone usually can mean switching between five IM clients at once. Well, today you can save a few bucks by chatting in the one IM client to rule them… okay, sorry about that. Plus: keep an eye on the stars for free and go hunting for Bambi and all his woodland friends. I hear they're virtually delicious. 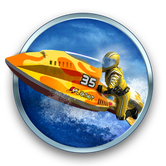 And finally, forget the cold; we're all going jet skiing with today's top app deals.